Convert your Instagram profile to a business account. You will love the contact feature & insights! A Business Profile on Instagram will help your customers connect to your business When converting to a Business Profile, you'll be able to include additional information about your business on your profile. For example, you'll be able to add a phone number, an email address and your business's physical address. Keep in mind that you must include at least 1 contact option. When you add contact information, a Contact button will appear near the top of your profile. When people click that button, they'll see options like Get Directions, Call and Email, depending on the contact information you provided. Additionally, when you convert to a Business Profile, you'll get access to Instagram Insights. These insights will help you learn more about your followers and how much your audience engages with your content. With the new tools, companies of any size can be recognized with a business profile, get insights about followers and posts, and promote posts to drive business objectives—all within the Instagram mobile app. That means customers can see valuable information in your profile—like your business address or contact info. And you can get actionable information about which posts perform best, which days of the week and times are best to post and the demographic breakdown of your followers. You can also promote any posts you’ve shared, and include a button like Learn More, to reach new customers in your target audience. Tap Switch to Business Profile. On the Connect Your Facebook Page screen, you'll see all of the Facebook Pages you're currently an admin on. Select the Page you'd like to associate with your Business Profile on Instagram. On the Set Up Your Business Profile page, review your business's contact information, make any changes and tap Done. With a business account, you'll get access to new business features and Instagram Insights. Note: Currently, a Business Profile on Instagram can only be connected to a single Facebook Page. 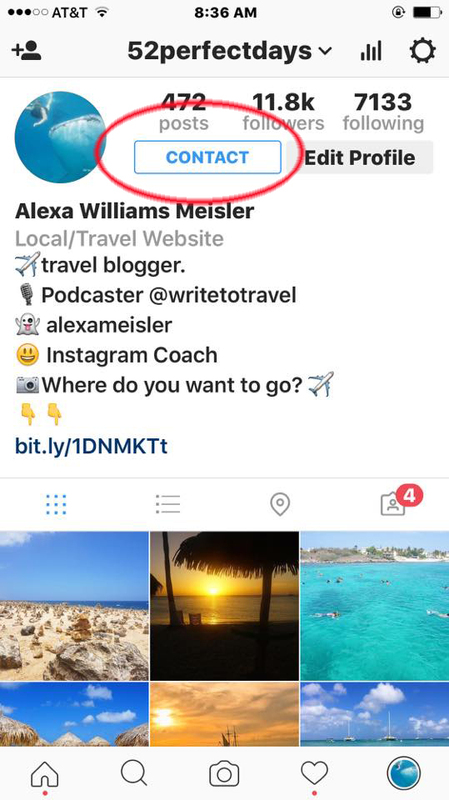 As a small business, entrepreneur or podcaster, you must have a contact option on your Instagram account. It's a simple way to allow customers or potential clients to contact you quickly. Best Instagram Hashtags for Entrepreneurs! Instant Free Access!